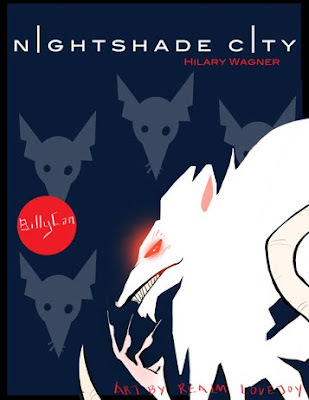 The illustration featured here is of Billycan, one of the bad rats of NIGHTSHADE CITY! He is a crazed ex-lab rat. My first time drawing a rat, so I had a lot of fun drawing this wicked character. NIGHTSHADE CITY is about a strangely intelligent colony of rats that live under a modern metropolis. Two brothers, Vincent and Victor Nightshade, escape the Catacombs, their underground home, run by the narcissistic Killdeer, the charming and decadent leader of the High Ministry, and Billycan, a slightly demented ex-lab rat, who commands Killdeer's Kill Army with a bloodthirsty fondness for butchery. Vincent and Victor soon meet up with Juniper, the ardent leader of a secret city and despised adversary of Billycan. Working with Juniper and his rebels, a fearless Ministry seamstress, and a relic tribe of earthworms, Vincent and Victor battle to defeat the High Ministry, realizing their future and releasing the ghosts of their past. NIGHTSHADE CITY delves into the true importance of family and freedom and how much both are worth fighting for. It's about never giving up and refusing to let a few decide the fate of many. 2) What inspired you to write a story about rats? I've always loved animals and I've always loved creepy! Rats were the natural choice. They are a nice mix of both. Rats can be cuddly and downright ratty! 3) Who's your most beloved rat and why? Honestly, I love them all. I love my wicked rats, just as much as I do my altruistic ones. No story is complete without some bad apples and I just love a good villain. They are the most fun to create, but the goodhearted rats are dear to my heart. I would have to say Juniper and Billycan are my two favorites. Juniper is the essence of goodwill and generosity, the kind of character you'd want to be your father, always with a glowing smile and a lively joke, a rat's rat! Billycan, on the other hand, is the embodiment of evil, a depraved, complicated rat, who'd carve your throat out merely for a giggle. 4) What's your favorite animal fantasy book of all time? Ummm....NIGHTSHADE CITY! Seriously, I'd have to Kenneth Oppel's Silverwing Trilogy is wonderful. His characters quickly became close to my heart and he is a marvel of description. 5) Can you give us advice on writing animal characters effectively? I'd say first and foremost, know your animal! Do your research. When I wrote NIGHTSHADE CITY, I read several books on them, learning their history, habitats, etc. I watched documentaries, studied how they moved, what they liked to eat, even how they use their paws and teeth. Research is a rewarding part of writing. It's like taking all the classes you wanted to in school, not the ones you were forced to. Once you've got that part down, the rest is up to you! Thank you, Hilary! Looking forward to the book's release next Fall and getting to know all your cool rats! Enjoyed this interview? If you're an author, editor, agent, or illustrator and would like a five question interview and a drawing of your character (or of yourself), email me at rtlovejoy (at) yahoo (dot) com. Check out the FAQ page for more info. Oh man, this gives me The Secret of Nimh flashbacks. That rat is scary! Great interview guys! Very creepy - nicely done R&H! Totally getting Nimh flashbacks here too. What a great cover; I love the scary eye, and the little curl of tail! Fabulous interview, Realm & Hilary! I HEART REALM LOVEJOY!! Realm, what a great job you did! My editor is going to see this and my agent was so impressed! She loved it as much as me! You have such a talent! What will you come up with next?? Great interview. I can't wait to read Nightshade City! Love this picture! Can't wait to read this book! TOTAL Nimh flashbacks! I love rats--in NYC we call them track rabbits. Thanks, everyone! It was so much fun drawing Hilary's wicked rat! Refreshing change from humans. Rat characters always make me nostalgic...so many cartoons and stuff with rats in 'em! This really makes me wonder what kind of warped rat inspired this illustration. I am intrigued already! Meera -- Billycan himself! The evil rats out there I can think of are pretty curvy and didn't particularly inspire me. Although memories of the rats in Lady in The Tramp and Nutcracker Fantasy are pretty scary. For Billycan, I wanted him to be unusually angular and sharp, so I made a white shape and used an eraser to carve out angles until I was happy with him. I'm loving these interviews and I am a huge fan of Marietta's! I just met her in LA and she was a doll - so if she's your agent, then I know I need to read your book! And Rat research? icky icky doo wah. Hold up! I didn't realize you did the artwork?! It's super cool! 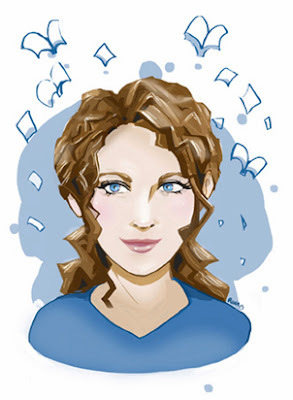 Katie -- Thank you! If you thought it was the actual cover, I'm flattered, lol! Katie! Marietta is so awesome! I'm so jealous you got to meet my agent in person! I'm in Chicago, so have yet to meet her in the flesh! She's great to work with and calls just to check in--so funny too! I'm very lucky to have her on my side!! I'm so glad I saw this. I too loved NIMH. It's so cool that a new novel about rats is coming out. I'm an avid Redwall fan, but I'd really love to read a book that puts rats in a different light than Redwall. Really like your illustration. Hope to see it and many more on a book cover some day! Don't know how I missed this before. Awesome illustration, and it's great to know what your first book is about, Hilary. I know I've been thoroughly enjoying your teasers! Yay!! Best book ever! Awesome interview and drawing again. Congrats AGAIN, Hil! !